Last year, I was asked by the slightly mysterious ‘Samuel Carver’ if I would be interested in an interview on Goodreads. Sam runs The Orion Team, a discussion group devoted to thrillers on the site, and he had written several very generous and in-depth reviews of my novels. I agreed, and the interview went ahead in January. It can still be read in full on the site, but as it’s a little buried there and the format isn’t all that easy to follow I thought I’d reproduce it here, with Sam’s permission and some very light editing. I really enjoyed this interview, and hope it will be interesting if you’ve enjoyed any of my fiction and are interested in how I work. I tried to avoid spoilers, but if you’ve never read a Dark novel this probably isn’t the best place to start. Samuel: You write Cold War spy fiction and created a unique protagonist, that of a jaded washed-out traitor who is trying to save his own skin, and along the way happens to do some good deeds in the situations he got himself thrown in. It’s rare to find such a morally compromised protagonist in 21st-century spy fiction. How did you create Paul Dark and how did he come together when writing him? Jeremy: Basically, I came to the conclusion after reading a lot of spy fiction that I wanted to write some. The spy fiction I most enjoyed was set during the Cold War and I thought I’d give that a crack—it occurred to me that it was becoming ‘period’ in the same way the Second World War had done for thriller-writers in the ’60s and ’70s, and there might be something new to do there. But what? I didn’t want to write a Bond clone, but I am fascinated by Bond. Ian Fleming’s wife Ann had been worried about Kingsley Amis writing a new Bond novel because of his politics, and wrote of him making a ‘Philby Bond’. John le Carré had also written in the ’60s of Bond being an ideal defector. That idea crystallised, and so I decided I wanted a protagonist who was a villain. Like Tom Ripley. Outwardly he might appear like Bond, and even have a Bond-clone kind of name that you’d expect from a ’60s spy, but then you’d soon realize he was a wrong ’un. That idea seemed to have legs to me, and I started researching Free Agent. Paul Dark is a traitor to Queen and Country and for all intents and purposes is a disgrace to SIS. However, you humanize him in several ways, chief among which includes making the ‘good’ guys that are trying to hunt him down bad, if not worse in the first two books. Was that contrast between a traitor who seeks repentance and the lawful authorities who are unforgiving and nefarious an intentional decision on your part, or did it come together by itself? Intentional. Initially, my idea was for Dark to be much more of an outright villain than he is. More like Frederick Forsyth’s Jackal: a cold-blooded killer you had no empathy for at all. But I felt that over the course of several books that wouldn’t work, and readers would find it unremitting. I wanted to give him some flickers of humanity. The situation of being a double agent had in-built suspense to it, but for that to work the character had to be afraid of getting caught and so on—I wanted the reader to be in his shoes to some extent. I thought I would try for a character who you weren’t entirely sure about. He could repulse you and scare you, but you could also find yourself, perhaps against your will, rooting for him. And I thought that one way to do that would be to make some of the characters trying to catch him a shade grey, too. Ah, yes. Shades of the treatment by the SDCE Action Service paramilitary unit can be seen in what Italian military intelligence does in Song of Treason. It can be argued that your novels are a genre-bending hybrid mix of historical fiction and spy novel, blending real-world incidents like the Nigerian civil war and the 1975 Victoria Falls conference with fictional events. Is it easy or hard to use real-world occurrences as the backdrops for fictional plots or not at all? I mostly find it hard, as I spend a long time finding the right events to use, and then researching them once I have. I initially decided on the assassination of Patrice Lumumba as being a key event in Free Agent, for example, before deciding that didn’t work. I worked on Spy Out The Land for months before realizing that summit had to be the major event in it. But once you have them in place there are some advantages: it’s a bit like a still life you can work around, if that makes sense. Delving into some of the parts of the Cold War that not even John le Carré covered, have there been any ‘no way’ moments when your jaw dropped and you found a piece of information or an event that astounded you in the writing process? 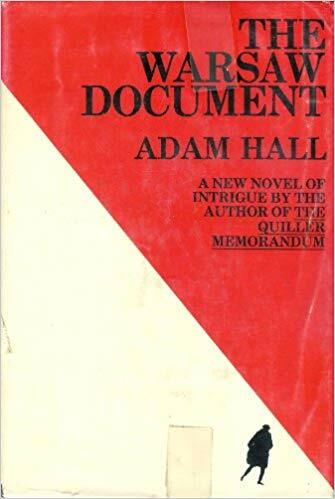 Your second book was full of these things due to the subject matter and how the central real-life element that the scheme hinged upon could have been easily perverted despite officially being used to preserve the liberties of democratic nations against godless totalitarianism. I don’t want to give away too many spoilers, but yes. Particularly in The Moscow Option, the Madman exercise and the mathematical calculations of winning a nuclear war both made my jaw drop. When I find things in research that astonish me, that’s when I start trying to figure out how to make them work in a novel. There was a detour between the first three Paul Dark books and the fourth one. What caused that? Also, who is the new cover artist? I must say they’ve done a bang-up job on enhancing the look of the books. The Moscow Option (Dark 3) features quite a bit of MI6’s activities in Moscow in the Sixties. When I was researching that to try to make it feel authentic, I found that the best source of most tradecraft from around that time was via the running of Oleg Penkovsky. I became fascinated by that operation and eventually pitched the idea of writing a non-fiction book on it. So I did that—it’s titled Dead Drop in the UK and Codename: HERO in the US—and it came out next. Then I went back to Dark for the next book, having taken that detour and recharged my batteries a little from writing Dark, as well. The cover art for the new UK ebooks is done by the art team at Simon & Schuster, but I had a fair amount of input into them. It’s a long process, and I discussed it back and forth with my editor and agent via phone and email for quite a while. But I’m really happy with how they turned out: I think they look clean and minimalistic, but give a clear idea of what kind of book you can expect. Spybrary Podcast: Jeremy, who do you think is the most under-rated spy/thriller author either living or dead? Which author do you wish more people were aware of? Do I have to pick just one? I’d go for three: Joseph Hone, Adam Hall and Sarah Gainham. Hone is quite similar to le Carré in some ways, but they have lots of twists and turns, and are just wonderfully written. As good as le Carré, Ambler and Greene for my money. Gainham is also in the Ambler/Greene vein and her prose is extraordinarily good. Lots of horrifying male characters. My character Rachel Gold in Spy Out The Land is partly a tribute to her—both her life and her characters, which were often intertwined. Hall’s series about British secret agent Quiller has obviously been a huge inspiration for me. I think they’re the most exciting spy novels ever written. And the writing is amazing, albeit very different from Hone and Gainham. Samuel: I haven’t asked about three people I’ll call ‘the Sharks’, as they work at the only Aquarium in Moscow that the public is not allowed into. The father, the son, and the unholy ghost of a false lover. How did you create these three very smart but very terrifying and brutal Cold War antagonists? Most Cold War antagonists are a bit over the top here and there, but ‘the Sharks’ of the Aquarium most certainly couldn’t be accused of such a crime. That’s very kind of you. I needed an emotional anchor for Dark and I wanted to connect with his past and his own family, so that is how one of them emerged. Sasha came about from researching double agents, in particular Kim Philby’s peculiar memoir My Silent War. There’s not a lot of tradecraft in that, but there is some, most notably his Kafkaesque travel routines to meet his handler. So I started thinking about who Dark’s handler would be, and what their relationship would be. How would he react once Dark started turning against the cause he had supposedly signed up for? And once the books gathered steam, I felt I wanted to see things more from his perspective, and that he would also have paternal issues, like Paul. That was also from research into Philby and others—many of the handlers of real double agents in Britain were summoned back to Moscow and purged. So I wanted to think through how Moscow would be viewing Dark, and they sprung from that. As a writer who writes books in the ‘retro spy fiction’ sub-genre, you immediately distinguish yourself from the pack in mainstream thriller fiction which focuses on the 21st century and contemporary threats that may or may not be done to death now and then. In your view, what does ‘retro spy fiction’ set in the Cold War offer readers compared to the contemporary post-9/11 thriller? And what does it offer you as a writer in terms of benefits in terms of story and appeal? My initial thinking behind it was in part to stand out from the pack, but also because that is just what I liked reading best, and was most familiar with. It also meant I could research it more easily, as a lot of Cold War stuff has been declassified. Of course, you can invent things if you’re writing about intelligence agencies now but, even so, I thought it would be fun to revisit the Cold War with what we now know. I’d seen the Bourne films with Matt Damon and thought they felt similar to conspiracy thrillers from the Sixties and Seventies in tone, as well as to the likes of Quiller, with chases through the Berlin U-bahn and so on. For readers, I’d hope it doesn’t make a huge amount of difference if a book is set in 1969, 1976, 2002, 2018 or 2051 as long as the story and characters are compelling. But perhaps there’s some interesting history you’ll learn about or get interested enough in to investigate further. And I don’t think the books date quite the same way, which feels like a bit of a safety net in terms of longevity. That may be wishful thinking, though. Ah, that last point is bang on the money. Dating has always been an issue. Out of all the real life traitors you must have looked up when writing the Paul Dark series, name one who was the most damaging of the lot. Then name another who you would say is the most audacious at his work. Then out of all of them would you say that with traitors, there is a common motivating thread among the ones you have researched? Great question. I think I’ll have to be a bit obvious, though, and say Kim Philby was the most damaging. Some have claimed George Blake did more. Andrew Lownie makes a very persuasive case for Guy Burgess in his excellent biography of him. But damage isn’t only about the number of documents they handed over, or even agents’ lives. Philby rocked British intelligence to the core, and to some extent the whole of the British establishment. It took them decades to recover. His friendship with James Angleton was also crucial—that gave him a lot of information, but it also meant that when he was finally exposed Angleton was shattered by the revelation. That led pretty directly to Angleton’s paranoia about other moles, which ripped the CIA apart for years to come. Philby caused all of that. Most audacious? Probably Burgess. To flaunt the fact he was gay and promiscuously so at a time when homosexuality was illegal, and on top of that to be drunk and rude to everyone, pretty much constantly… these aren’t strategies most double agents would employ, as they want to keep as low a profile as possible. Burgess went the other way. The common motivating thread would probably be intellectual superiority or arrogance, coupled with stubbornness. Even now Blake thinks he was right and knows better than everyone else. Also, I suppose, a gift for self-delusion: to continue to believe with such certainty even when all the evidence tells you otherwise. This is why I decided to try to make Dark a little more sympathetic, incidentally. He realizes the cause is nonsense, and he regrets it. To have a Blake would change the dynamic completely, and I think it would be very hard to keep the reader along for the ride. The first three novels in the Dark series were told in first person. The fourth novel, however, which could be considered a ‘soft reboot’ of the series after a long hiatus, was told in third person. What prompted the change in storytelling perspective? And was it easy or difficult to adapt to this change? The BBC optioned the first three books for a TV series quite early on, and they got as far as a pilot script for Free Agent but no further. But that involved a lot of discussions, and the producer said early on the series would have to be very different from the books because you can’t really do first person on screen. He mentioned the dynamic of the Bourne films, where you switch between Bourne’s perspective and the CIA crow’s nest hunting him. That stuck with me. After three books from Dark’s perspective, I also thought it would be good to open things up—and to see what the world made of him. With each book I have a tone in mind from the start, and the kind of thriller I want it to be. With Free Agent, I had Adam Hall and Deighton in mind, for example. With Spy Out The Land, I wanted to write a fast-paced third-person man-hunt thriller in the vein of The Day Of The Jackal, and I was also inspired by some of Ted Allbeury’s stuff. So that was the basic idea going in. I found it much harder to write than the first three, though, because I had become used to Dark’s voice. I doubted I could even write a third-person novel at all, and felt like I had been a fraud for being published with first-person narratives. A third-person novel was a Proper Book! But I got there in the end. Ah, intriguing. I agree, the so called ‘rules’ about third person, first person and hybrid third person and first person perspectives are rather tricky. The tactics Paul Dark utilizes in his attempts at saving his neck are the foundation of what even in the era of SVR cyber-trolls and PRC artificial intelligence is considered modern tradecraft. From your research for your novels and journalism, would you say modern espionage techniques and tradecraft hasn’t changed much despite the bells and whistles that the services pay for? Or has it evolved beyond recognition since the Cold War? I’m probably not the best person to ask about modern tradecraft, because I don’t know nearly as much about it—I’ve spent significantly more time looking at the Cold War. But I would say that a lot of the techniques are pretty similar, and made easier or at times complicated by changing technology. But you still need dead drops and forged papers and spies on the ground and all the rest of it. The Moscow Rules that were developed after the Penkovsky operation haven’t fundamentally changed, even if the nature of threats has. Can you name any contemporary-set mainstream published spy fiction which has gained your approval in recent years? Or are you a fanatical vintage purist who does not wish to be sullied with works set in the post-9/11 world? I’m not a purist in that sense, but I don’t read nearly as much spy fiction as I used to—I tend to find it distracting. An exception is Tim Stevens, who I’ve mentioned in a few places before and who I know a little: he’s a really terrific writer. Start with Ratcatcher. I also love the French TV series Le Bureau des Légendes, which is a contemporary classic, I think. Oh, and I really enjoyed Mick Herron’s Slow Horses, and am looking forward to reading the rest of that series when I find time. Looking at the spy fiction genre today, what could be done to help improve the genre? Or if you had the power to warp reality, what would you do to improve the genre? I’m honestly not qualified to answer that one. I just don’t know enough about what other writers to do to offer any kind of suggestions, and even if I did—well, it’s just me. There’s room for a lot of different kind of writing in the genre, I think, and that’s partly why I fell in love with it in the first place. It’s so much richer than I’d thought it was. Paul Dark isn’t intended to be a nice man and for the first three books, his fundamental motivation is (very understandably) selfish self-preservation. He also wallows in self-pity that most people would find contemptible. On the other hand, he’s aware of his crimes and mistakes and wants to make them right and seek absolution for his big sin, despite the cruel world he’s in trying to squish him like a bug. What elements of Paul Dark’s characterization came from you? The Oxbridge education? The details-orientated professionalism that Dark maintains despite the near panic he’s in through the original three books? The vague centrism in a world where’s he’s surrounded by loonie lefties and shot at by right wing whack-jobs? Or is it something else? And what quality, if any, do you most admire about Paul Dark? Reason for this question is because when writing a character, most writers past and present make the viewpoint protagonist their fictional alter ego, like Ian Fleming or Brad Thor. And even those who try to avert this like Tom Wood with his assassin Victor still have bits and pieces of themselves end up in their creations. I think it’s inevitable there are bits and pieces of me in the character, because they just seep in whether you want them to or not. I’m usually trying to figure out what I would do in his shoes, so of course that makes him more like me from the off. I deliberately gave him a background I shared some elements with, even if twisted, like his knowledge of Sweden and a particular archipelago nearby. He went to the same school I did, so I could use some of my knowledge there. I did all that because, fundamentally, I’m of course nothing like him: he’s a ruthless professional secret agent, and a traitor to his country. I don’t see Dark as a fantasy version of me in any way, but occasionally he does things—I have him do things—I admire in one way or another. It would be quite nice to be able to know how to avoid the world’s intelligence agencies, even if I’m never going to need those skills. I’d quite like to be as quick-witted, fit and have his line of laconic humour sometimes. I am also probably less harsh on him than readers, because I’m in his head and he’s ‘My Guy’ in a unique way, because I created him. I want him to be very flawed, but not a complete monster. At points in writing the books I have felt like I am under his skin. Maybe he was under mine. The vague centrism hadn’t occurred to me—quite a good point. I guess that might have seeped in. I tend to be sceptical of left and right, it’s true. What’s your preferred writing style? Outliner like Robert Ludlum, or seat of the pants like Fleming and Vince Flynn? Some outlining, a lot of improvisation along the way (including more outlining). Too much outlining in advance and I find I’m bored and see it as pointless to write the book. But I need a tone and some central ideas or I’m totally lost and end up wasting lots of time rewriting. Did Ludlum outline? For some reason that surprises me a little. Oh, yes. Had literal dossiers and files of the plans he made on his trademark yellow legal pad paper which he worked on. As for that vague centrism, well Ian Fleming said James Bond would probably vote for the Labour party, and I’d say it’s rather beautifully (but unintentionally) symbolic as Dark is hounded by the two political extremes in a world that was far more polarized than this century. Now to the next question. Having written my reviews of your work listening to Rossini’s The Thieving Magpie and Elgar’s Pomp and Circumstance March 1 (possibly the most inappropriate, ironic musical choice ever considering who Paul Dark is), do you have a reading playlist? Didn’t know that about Ludlum—interesting. I listen to music when I read and write—always instrumental, usually a very long playlist I have on Spotify that mixes classical, jazz, electronica and so on. I listen to a lot of music when away from my desk and thinking about writing, and there’s a public playlist on Spotify with songs that inspired me when writing Spy Out The Land. Thank you very much for your excellent reviews, by the way. Much appreciated. What is the general future direction of Paul Dark? I have a couple of ideas. We’ll see. I like him in the ’70s—there’s a lot to explore. Name a real world Cold War event and one country that Dark hasn’t been to yet, that you know about and would love to write a story around. There are at least two but it’s because I want to do them that I can’t tell you, sorry. I don’t want someone else to beat me to it! But one’s in the Middle East and one’s in the Far East. A wise decision, keep cards close to the vest. Okay, the next few questions will focus on writing matters. To any aspiring writers out there who may seek to follow your path and become a published writer, what advice would you give them on what to expect, what difficulties if any may ensue and what they should look out for to get the most out of their publisher? Everyone’s experience is different, but I suppose my main piece of advice would be not to expect the world to fall at your feet—there are a lot of books out there—and also to keep your integrity. Some people like to take shortcuts, and the internet has made that easier, but these things have a habit of coming back and hitting you in the chops. Be enthusiastic, get stuck in, do all you can to promote your work and attract readers and so on, but try to keep your scruples intact. All publishers are different, but I think they all like their writers to be professional, to listen, to pick their battles and... to be nice. It’s a good idea, generally, I think. Dialogue and word choice are probably the bit that aspiring writers fall down on. How do you come up with the right thing to say for the right scene without it sounding clunky or messy? And how long would you say it took to find your own prose style that was distinct as it is today? Read a lot, write a lot, hone your voice. Read your work aloud, especially dialogue. Cut anything that sounds unnatural. Resist the temptation to show off, i.e. purple prose. I don’t want any fat in my work. ‘For me, anyway, I want there to be absolutely no fat at all in my books’ was my first draft of that sentence. Thank you for saying my style is distinct. It took me around seven years to get a draft of Free Agent I was happy with. Keep at it until you’ve written something like the book that you envisioned in your head. Action scenes are, if not the heart of the thriller, the blood and veins. Tell us about your process in crafting an action scene. Advances the plot: everything has to do that. Don’t drop your guard just because people are using their bodies as well as their minds. Exciting: it should have some stakes the reader thinks Dark might reasonably come out on the wrong side of. Harder to do in first person as of course we know he will survive. Plausible: He’s not a superhero. I often use martial arts guides from the period for plausibility and authenticity’s sake. Unusual: Is he simply being chased down a street? That’s not very interesting. What if he’s being chased down a street by one person and then realizes a completely different enemy is chasing him from the other end? It’s a fight on a rooftop, okay. What if the rooftop is the dome of St Peter’s in the Vatican? Historically relevant: I don’t always do this, but like to have it so the scene can’t have taken place today, or even can only have taken place at the time I have it. So it’s Rome in 1969, not Rome now. The topmost dome is no longer open. I want every element of the novel to be necessary for this story, and this story alone, not interchangeable. These aren’t hard and fast rules. The first three Dark books brought to life 1969 beautifully. Whether it being the exotic but very murky Lagos, the intimidating but dark heart of Rome (pun not intended) or a run across the snow-swept wastes towards the Russo-Finnish border, how do you go about building your setting? And what’s the key to building a fictional universe in your opinion? That’s very kind, thank you. In my case, a lot of research on the basics. So I spent a long time looking into how one could get across that border, for instance. How long was it, how many watchtowers, dogs, what was the border guards’ routine, who had tried to do this before, etc. I look up weather, contemporary street maps, sometimes visit the place if it makes sense—I did that with Rome—watch films from the time that feature the setting. Then there’s sense memory—I grew up in Lagos—and of course imagination. I throw out a lot of research. You want to hone in on the most vivid details you can. A phrase or even a single word can bring somewhere to life if you place it properly. If there is a key, it might be that when it seems real to you it will to the reader. What’s your editing process and what sort of things do writers need to do to edit properly? I don’t have any real process for this. I try to get to the end of a first draft with as little editing as possible, because otherwise you can get hung up. But sometimes that happens despite my best intentions. After the first draft I just keep editing it until I’m happy. Apart from the obvious things like attention to typos and other errors, I watch for voice—the characters should sound distinct. Plot holes, of course. And that the novel feels like a coherent whole. All writers have their own writing routines, the most famous being Fleming and Hemingway (recently there was an article in Publishers Weekly about someone trying to follow the writing routines of famous writers and he said it sucked—perhaps it was the alcohol). Can you describe your own writing routine? I don’t have one. In the research phase, I tend to read a lot in the day and search for things online late into the night. In the initial writing phase, I try to write every day, sometimes using a word-count as motivation. In the editing stage, edit every day if I can. But none of it’s in stone. Sometimes the key is to get away from the desk and go for a walk or a swim or have a coffee or just stare into space for a bit. For me, writing a book is a cross between being disciplined enough to write that many words, and undisciplined enough to have the inspiration and creativity to do that. The friction between routine and no routine is what makes it work—but it’s a lot easier said than done.